The maiden Edition of Pondicherry International Film Festival 2018 culminated with a jubilant award and closing ceremony on Sunday, 30th Sep’ 18 at Alliance Francaise de Pondicherry Auditorium, Puducherry. 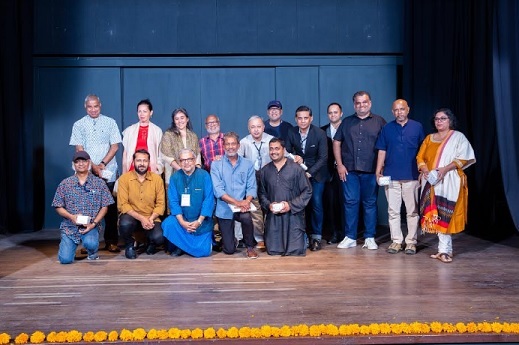 Mr. Abhishek Sinha, Founder & CEO and Mr. Saibal Chatterjee, Festival Director also took the opportunity to thank International and National Film Directors, eminent dignitaries, sponsors, funders and media partners without whom the Festival would not have been possible. Present at the occasion, CM of Puducherry Shri V. Narayanasamy reiterated full support by Puducherry Govt. to Pondicherry International Film Festival to make it a bigger annual affair from next year. The Best Feature Film of the night won by Ektara Colectove for their masterpiece TURUP which was a tie with TO LET. TURUP is based on the game chess, which is a popular pastime in neighborhood, with roadside games bringing together men, to challenge each other in friendly and sometimes unfriendly matches. But for some, the pawns include morality and religion causing tensions to erupt. On the other hand, TO LET is based on the story of a couple with a child which is set in 2007 in Chennai which is experiencing a real estate boom as a result of an exponential development of the IT sector. The biggest winners of the night were TO LET and TURUP as the former won Best Feature Film, Best Editing (Feature) and Best Director (Feature); whereas TURUP bagged the Best Feature Film, Best Screenplay (Feature) and Best Cinematography (Feature) award. Apart from that, Sahar Soleimani from Iran won the Best Short Fiction Film category for Isolated Crows of Solitude, whereas Linda Dombrovszky of Hungary bagged the Special Jury Award for Cubeman. The award for Best Short Animation Film was bestowed upon Numan Ayaz of Turkey for Blue Tomorrow. 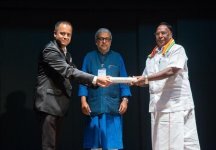 Honorable CM of Puducherry Shri V. Narayanasamy handed over the Best Feature Film Award to Chezhyian for TO LET while Actor Adil Hussain presented the Best Editing (Feature) to Chezhiyan who accepted it on behalf of A. Sreekar Prasad for 'TO LET'. The category of awards at the festival included: Best Short Fiction Film, Short Fiction - Special Jury Award, Best Short Animation Film, Best Feature Film, Best Director (Feature), Best Screenplay, Best Editing (Feature), Best Cinematography (Feature) and Best Documentary. The 5 day long festival was inaugurated by honourable CM of Puducherry Shri V. Narayanasamy on 26th September at Alliance Française de Pondichéry followed by screening of National Award Winner for Best Tamil Film (2018) 'TO LET' by Chezhyian. The movies were screened across Puducherry at multiple locations: Alliance Française de Pondichéry, Multimedia Center Auditorium in association with Cinema Paradiso (Auroville) & amp; Aurofilm (Auroville), and J N Auditorium, Pondicherry University. The Opening Night of the festival was hosted at the French Consulate Pondicherry on 25th Sept in the presence of French Consulate General Mrs. Catherine Suard with special screening of Félicité by Alain Gomis winner of Silver Bear Grand Jury Prize at Berlinale 2017. The Festival's competitions featured a diverse slate of 5 animation films, 9 Feature Films, 9 Documentary and 7 Short Films, 15 Drama, 1 Thriller, 1 Fantasy family and 1 Horror representing 16 countries. PIFF closed with jam up session by Jerry Silvester Vincent, Music Producer of AR Rahman and crew. He also played complete original soundtrack (8 themes and a song) of an awards nominee in the short film category - Asmad (Me). The jam up session was followed by dance performance by Poojarini Chowdhury‘s Red Feet Dance Studio, a Pondicherry based dance troupe.